Cooper Eckert (5) of Fairfield Prep takes a shot from the point during a game between Hamden Varsity Boys Ice Hockey and Fairfield Prep Varsity Boys Ice Hockey on January 26, 2018 at the Wonderland of Ice in Bridgeport, CT.
BRIDGEPORT — It’s not that Fairfield Prep didn’t have a number of defensemen in its hockey program who could play. What Cooper Eckert and Peter DiDomenico could bring in the back end, though, was enticing as the season began. There was one issue: They were forwards. At tryouts, Eckert said, he listed himself at both positions. “It might be a hard transition, but I think in the end, if it helps the team the most, it’s worth doing,” Eckert said. Their adapting to defense is one factor in the Jesuits’ second-half surge that has boosted the Jesuits, 8-7, above .500 for the first time this year. Fairfield Prep, tied for third in the new GameTimeCT poll, has won five out of six going into Wednesday’s rematch with No. 1 and undefeated Ridgefield at the Winter Garden in Ridgefield. The Tigers beat the Jesuits 5-2 on opening night, Dec. 12, at the Wonderland of Ice. The Jesuits’ growth starts in goal, coach Matt Sather said, where senior Jake Walker has been their best player and has learned to control a game. That defense also had a lot of newcomers, and Sather saw a chance to make it more a more diverse corps with the two forwards. He had a different reason for both. “With Peter, I felt there was an aggressiveness there, a physicality, that could be useful to us, and I felt that it was easy to find in the forwards we saw trying out and rare in the defensemen,” Sather said. 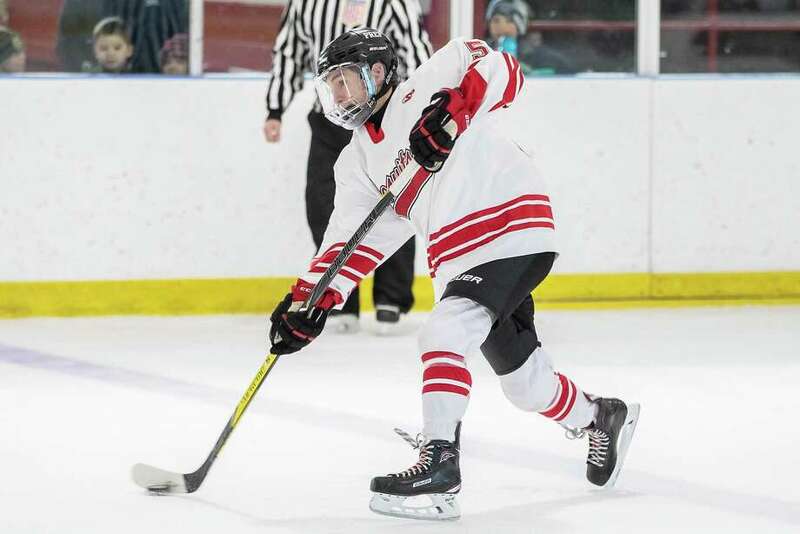 Having their ability to outlet the puck has helped balance the team’s offense, Sather said, taking some of the pressure off the potent top line of Calyb Reeves, Chandler DuMont and Colin Bella. Assistant coach Rudy Mauritz, who coaches the defense, said Eckert and DiDomenico both carry and pass the puck well. Eckert said he played some defense in the fall, partly intrigued by the idea, partly thinking it might help the team in the winter. “From an offensive standpoint, I’ve had a lot of fun. It’s been cool to see the whole ice,” Eckert said. DiDomenico said he’d played a little defense before, but “not seriously.” He expected it to be a challenge, but he said he’s had plenty of support from his teammates.